Mom always said “research what you’re buying!” Â Well maybe she didn’t but it’s something that’s considered common sense however we’ve all neglected to do it ourselves. 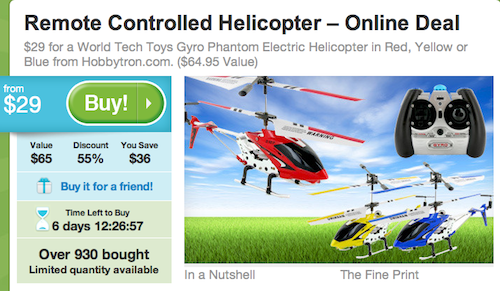 Â I got an email today from Groupon for a remote controlled helicopter. I bought one of these. Â I bought one a while ago on Amazon for .99. Â The copter is actually pretty good at flying. Â A lot better than similar ones in the – range I’ve tried. 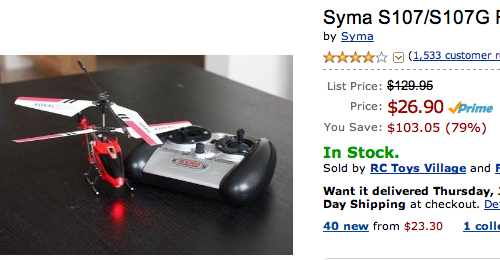 Â The helicopter is available on Amazon right now for .90 + Free Shipping. Â You can get it here!Â It just makes me wonder how many people had seen this and just went for it when it really wasn’t a deal. Â I’ve purchased a few things through Groupon thinking it was a deal but when I see something like this it takes my confidence away from the company. Â Not only is Groupon causing a lot of problems with some businesses, it’s posting deals that aren’t even deals! Different merchant, same helicopter. Â Have you bought a deal that wasn’t really a deal?